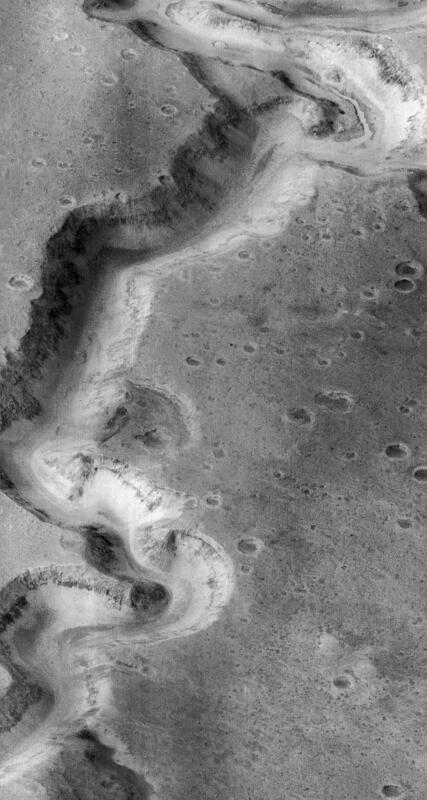 Nanedi Vallis: Sustained Water FLow? 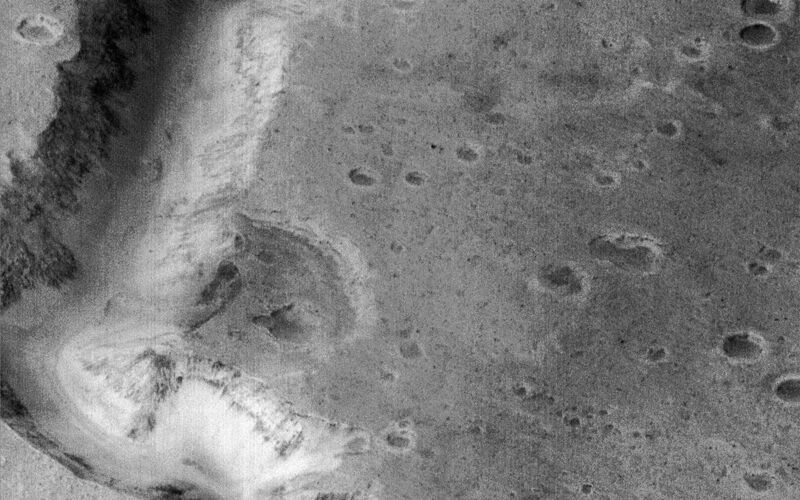 This picture of a canyon on the Martian surface was obtained a few minutes after 10 PM PST, January 8, 1998 by the Mars Orbiter Camera (MOC), during the 87th orbit around Mars of the Mars Global Surveyor spacecraft. 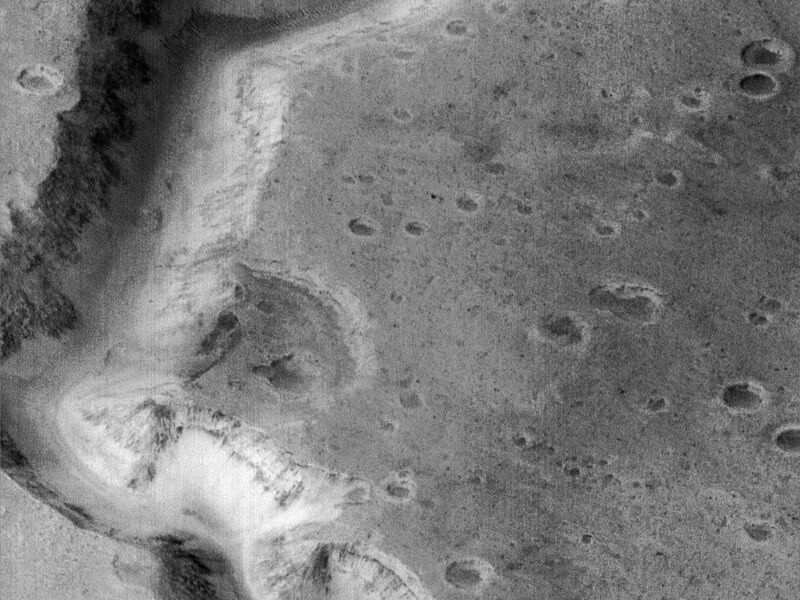 It shows the canyon of Nanedi Vallis, one of the Martian valley systems cutting through cratered plains in the Xanthe Terra region of Mars. The picture covers an area 9.8 km by 18.5 km (6.1 mi by 11.5 mi), and features as small as 12 m (39 ft) can be seen. The canyon is about 2.5 km (1.6 mi) wide. Rocky outcrops are found along the upper canyon walls; weathered debris found on the lower canyon slopes and along the canyon floor. The origin of this canyon is enigmatic: some features, such as terraces within the canyon (as seen near the top of the frame) and the small 200 m (660 ft) wide channel (also seen near the top of the frame) suggest continual fluid flow and downcutting. Other features, such as the lack of a contributing pattern of smaller channels on the surface surrounding the canyon, box-headed tributaries, and the size and tightness of the apparent meanders (as seen, for example, in the Viking image 89A32), suggest formation by collapse. It is likely that both continual flow and collapse have been responsible for the canyon as it now appears. Further observations, especially in areas west of the present image, will be used to help separate the relative effects of these and other potential formation and modification processes. Malin Space Science Systems (MSSS) and the California Institute of Technology built the MOC using spare hardware from the Mars Observer mission. MSSS operates the camera from its facilities in San Diego, CA. 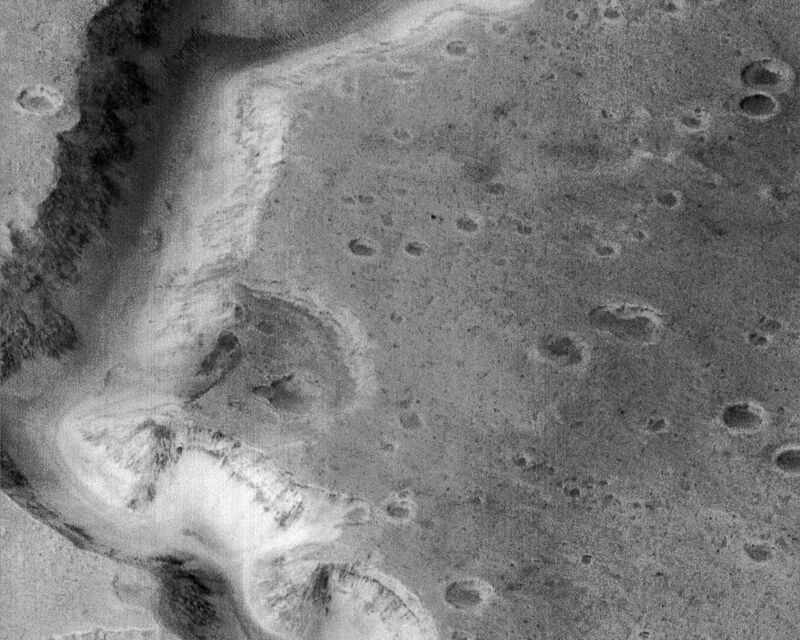 The Jet Propulsion Laboratory's Mars Surveyor Operations Project operates the Mars Global Surveyor spacecraft with its industrial partner, Lockheed Martin Astronautics, from facilities in Pasadena, CA and Denver, CO.